With a romantic overlay for Valentine’s month, a new segment of the “The Magic, The Memories, and You!” projection show on Cinderella Castle is set to debut Feb. 1 for Walt Disney World Resort guests. For the first half of Valentine’s month, until Feb. 15, some of the most romantic moments in Disney animation will inspire the special show. The iconic castle in Magic Kingdom will be covered in red roses for one sequence and turned into a beautiful, star-filled sky for another. 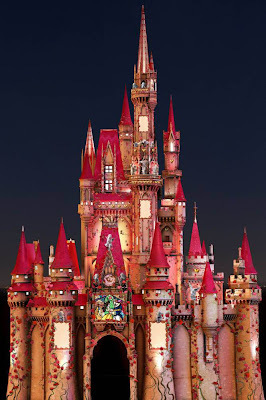 During part of the show, spectacular stained-glass windows will grace the façades, depicting the stories of Cinderella, Snow White and Belle. “The Magic, The Memories, and You!” is a part of Disney’s “Let the Memories Begin” in 2012.